UKYA needs to be championed by all who love it. Reading books by UK authors is so inspiring, especially because both Bee and I want to be authors some day, and part of not just the people who love it, but the people who create it. So, without further ado, let’s have some recommendations! I almost can’t believe this book is written because it’s so realistic, I’m not quite sure how Alice Osman wrote down what teenagers think that accurately! Tori Spring, the main character, is a child of the internet and a pessimist. She mets a boy called Michael Holden, who helps her to realise that she’s not alone. 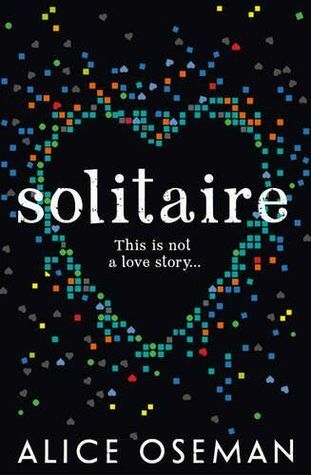 What makes ‘Solitaire’ so great, though, is that it’s not a love story. Who would have thought it, a boy and a girl can be friends without a romantic attachment! There’s some mystery and some mental health and sexuality representation…it’s got everything you need and everything the current YA market is missing. Read it, like, now. I will champion this book to my grave, I swear. A lot of the UKYA that’s popular are contemporaries. ‘Fearsome Dreamer’ makes it’s own YA genre, as a mixture of technology and fantasy. There’s magic. There’s computer-generated worlds. There’s a ghost girl, and a hedgewitch and a monster lurking in a creepy castle. So many beautiful things combined to make the most exciting and vivid duology. Again, I could not recommend it more. UKYA Day is just another opportunity for us to rave about how much we love the ‘Geek Girl’ series. Harriet Manners is an amazing character – she’s well-rounded, endearing, hilarious, sweet and a little bit clueless. (All my favourite qualities!) I don’t think I’ve ever laughed so much at four books. FOUR BOOKS. If you haven’t started this series yet, you’ve got a lot of amazing UKYA to catch up on! This EXCELL ENT book often slips under the radar, because it was published in 2010. ‘Lula’ was probably our very first UKYA, and we will treasure it forever. Like ‘Solitaire’, so much goes on within this book. It’s not just one girl’s quest to be kissed before her 16th birthday. It’s a crime mystery, there’s a witchy presence in the forest and Lula has a job all book lovers would crave. She works in a library. Funny and adorable, ‘Kisses for Lula’ is not to be missed. All the books I’ve recommended so far have been quite cute. 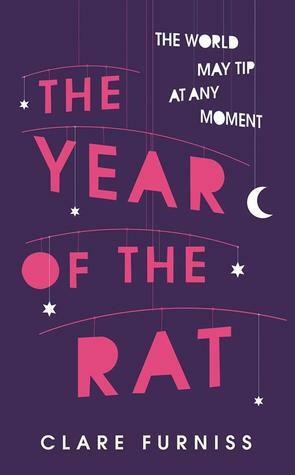 ‘The Year of the Rat’ is completely different. I absolutely love books that deal with difficult subjects, like bereavement. What was so amazing about this book, was its sense of realism. The protagonist, Pearl, did not glamourise the situation. She was not mature and sensible. She was a real teenager, dealing with the death of her mother. If you’re looking for something a little deeper than a search for true love’s kiss, this is it. What would you recommend on this glorious UKYA Day? Let us know! I was so excited for the sequel to Fearsome Dreamer but somehow I managed to put off reading this book for months due to other reading endeavours. But I was so glad I waited to read this majesty of a book. ‘The Illusionists’ fulfilled my expectations of how this series was going to end. Of course, I had no idea how the series was going to end, Laure Eve has a wonderful way of keeping you guessing. I didn’t see any of the twists coming, which I was thankful for, otherwise I would have been heart broken. I really think that both books in this duology have really branched out into a new genre. I’ve never really read ‘technofantasy’ before and now I’m desperate to get my hands on more, hence my newly found love for the ‘Under the Never Sky’ series. Rue is such a strong main character, the world building is excellent and you really know what Laure Eve was trying to create with this book. I can’t talk that much about ‘The Illusionists’ without giving away HUGE spoilers, which I don’t want to do. If you’re interested in finding out what happens to these marvellous characters then you’ll have to read it for yourselves! However, I think that the cliffhanger that was tacked on the end of ‘Fearsome Dreamer’ perfectly prefaced this book. The monsters in the Castle and the threat to mankind was thrilling and really underpinned the whole plot. The relationship between Rue and White reached its peak and I’m so glad that the two of them found happiness. They were the cutest things ever and just…meant to be! Everything I type must sound really subjective because I just love this series so much. Good just doesn’t begin to describe it. For the first time in ages, I read a book in under three sittings. I swear, I read about two hundred pages way past when I should have gone to bed because I just couldn’t put it down. The action and the drama has you hooked throughout and the changing perspectives help to freshen up the setting and the pace of the book. The only bad thing about this series is that it only consisted of two books. I would have loved for Frith and Oaker’s relationship to be explained more. I’d love to know more about the primordial gods that Rue and Angle Tar believe in. What happened with the technophobes? Some of the surrounding plot points seemed to have been forgotten as Rue, White and Wren tried to close the Castle and dispel the threats it was creating. I just need MORE! Thank goodness for fan fiction. Overall, I’d give this book 4 out of 5 stars. I didn’t love it as much as the first book, but I did love the addition of actual romance, the emotional torment and the small amount of Cho’s perspective we were given. The epilogue (and Fernie) just threw me for a loop, and I couldn’t stop thinking about the whole thing for days after I read it. Definitely would recommend. Laure Eve has created a beautifully original new genre of book, combining fantasy, technology and romance in a stunning debut novel that could not have been more satisfying. 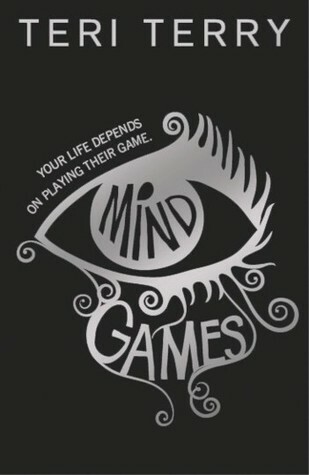 Although the blurb suggests the story is told from Rue’s perspective, it is not only Rue’s mind we inhabit. Two other characters, both male, White and Frith offer their thoughts up to the scrutiny of readers, adding to the well roundedness of the novel. Each character has such an action packed story line, I would have been completely happy to have read individual books about each character. Rue is a girl who was training to be a hedgewitch but felt that she was not as well suited to the role and knew that she had a power that made her different to other people in Angle Tar, the remote island where she lived, that had separated itself from World. World is the rest of the world; countries that have come together, united under the technology of Life, sort of like a simulator that means travel is no longer an object and people can just connect to Life in order to meet others, shop, go to school, everything! White lived in World, but was being persecuted for his powers, the same powers Rue possessed, but he dealt with them with a lot more experience. He wished to seek the refuge of Angle Tar, a place that would not threaten a prison sentence for being a Talented individual. Frith is a government agent, working to recruit Talented people like Rue and White in order to train them to be used for government means. Undertones of evil, I suspect. Sometimes when a story is told from multiple perspectives in can be clumsy and ineffective, yet Eve’s characters wove together perfectly and the POV changed at just the right moments in order to gain the biggest scope of the story world. I was expecting more love story between Rue and White, because their romance was tantalizingly forbidden by society. Neither Rue nor White would admit they had feelings for each other, leading to ultimate distress at the end of the novel for White in particular. But I think Eve has left it at a dramatic place for the next book – fingers crossed they’ll actually get the kisses they both crave! Slowly, we were fed information about Angle Tar and World from a variety of sources and an emphasis was placed on choosing whom to believe. My advice: never trust people with unnatural eye colours. They’re just looking for trouble. I loved the ambiguity surrounding the government and their involvement in things. 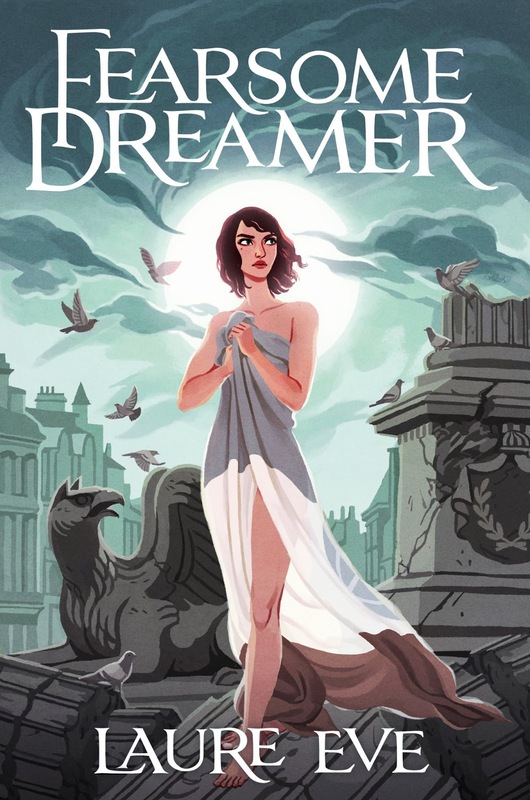 Sometimes when explanations are too explicit it’s easy to see how the characters are going to react to the corruption but ‘Fearsome Dreamer’ left a lot unsaid which just made me want to read more and more. What’s the ‘Castle’? Why is there a ‘Ghost Girl’? Who are these people? Who am I? Overall, I’d say that ‘Fearsome Dreamer’ is like nothing else out there. I never knew where the book was going to take me, literally, and loved the sense of surprise with each new development. I feel I’ve really discovered a gem with this book and can’t wait to read the sequel ‘The Illusionists’ in August (which could not come soon enough!) Did I mention that the covers are beautiful? I need this book constantly on display so I can bask in its beauty for as long as possible. I’d definitely recommend this book to anyone that is willing to try something different compared to the popular ‘girl vs government’ dystopians that are flooding the shelves at the moment.